The 1979 sleeper hit Going in Style pooled the talents of two Oscar winners, George Burns and Art Carney, and one Oscar nominee, Lee Strasberg. 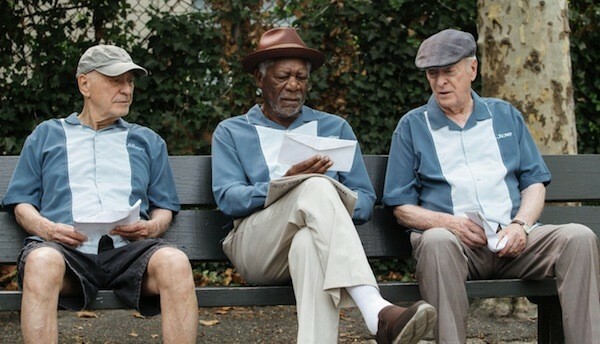 The new version of Going in Style ups the ante — and simplifies the poster credits — by casting all three central roles with Academy Award winners. As before, the plot concerns three elderly men (Morgan Freeman, Michael Caine and Alan Arkin) who decide to rob a bank in order to improve their collective lot in life. The social outrage has understandably been amplified in this new version — the ’79 crew just wanted to live a little, while the ’17 outfit is hoping to avoid eviction that’s the direct result of job outsourcing and banks too big to fail. Yet the tradeoff is that the delicate balance between humor and pathos that informed the original has been replaced with broader gags and more blatantly manufactured sentiment. Still, there are worse ways to spend time than in the company of three consummate pros known for being all style and all substance.